Although the proposed FY2011operating budget for the State of Illinois, which includes a $4.7 billion annual deficit and carrying forward $6 billion in unpaid bills, has garnered the most attention since being released on March 10, 2010, Governor Pat Quinn also proposed an expansion of the capital budget in FY2011. The Governor’s proposed capital budget for FY2011 comes on the heels of a massive increase in annual capital appropriation totaling $30.5 billion in FY2010 and recommends an additional $4.3 billion, or a 14.1% increase, in statewide capital appropriations in FY2011. The Governor’s recommended capital budget and the operating budget have been proposed separately since FY2005. The budgets are treated differently primarily because appropriations in the operating budget are intended to be spent only in the year they are approved while appropriations in the capital budget to fund large infrastructure investments often take several years to complete construction and must be reappropriated each year as a project moves forward. The Governor recommends new appropriations of $4.3 billion in FY2011 and reappropriation of $26.2 billion from the Illinois Jobs Now! program that began last year. The proposed increased capital spending in FY2011 will be funded primarily through current State funds, new capital purpose borrowing and includes a small amount of additional federal funds. The following pie chart shows the distribution of the $4.3 billion in new spending by funding type. Current State funds, which make up 58.6% of the funding for new projects, are a combination of fee based special funds (such as the Road Fund), other revolving loan funds and existing proceeds from previously sold general obligation bonds. The new bond funds totaling $1.6 billion will require a three-fifths vote of the legislature to be added to the $5.9 billion in new debt approved to fund the original spending. The State originally estimated it would need to borrow $12 billion to $14 billion to complete all the new state funded projects in the capital budget. However in the proposed capital budget presented for FY2011, the Governor estimates the State will sell a total of $19.0 billion in capital purpose bonds between FY2010 and FY2016, while retiring only $1.9 billion of existing capital debt in the same years. 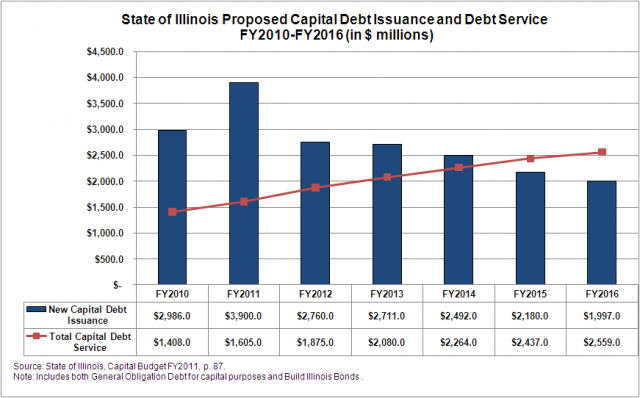 The following chart shows the estimated annual debt issuance for capital including General Obligation Bonds for capital and Build Illinois Bonds compared to the total debt service new and existing capital debt. Prior to issuance of the new debt proposed in the FY2011 budget, the State estimates a combined $13.3 billion in outstanding G.O. 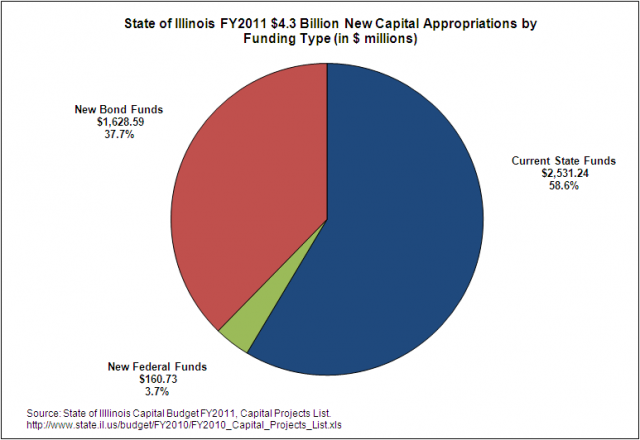 bonds for capital and Build Illinois bonds by the end of FY2010. This does not include the $13.3 billion in Pension Obligation Bonds the State has outstanding after borrowing $10.0 billion to catch up on payments to the retirement systems in FY2003 and the $3.5 billion borrowed to pay the required annual contribution to the pension fund in FY2010. However, as discussed previously on the blog it is questionable whether these revenues will produce the estimated $942 million to $1.2 billion in necessary revenue to cover the increased debt service related to the capital borrowing. The FY2011 capital budget does not include updated projections for the capital plan revenues or suggest any additional funding to support the increase of $1.6 billion to the borrowing for the capital budget. Similar to last year’s proposed capital budget, which the Civic Federation opposed, the Governor’s recommended increases in capital spending are not based on a comprehensive capital improvement plan (CIP). Although details of some projects are discussed in the capital budget book and a full list of 8,774 projects was released with the budget, there is no explanation of how the projects are prioritized. There is also no indication whether projects are based on actual needs of departments and there is no inventory of existing capital assets or state owned and maintained infrastructure. It is also unclear in what order the projects will receive funding or when the projects approved in the budget will be completed. The Civic Federation continues to urge all governments, including the State of Illinois, to prepare and make publicly available a sufficiently detailed multi-year capital improvement plan that includes criteria used to assess capital needs, a multi-year capital improvement needs inventory, and a multi-year plan that shows when projects will be undertaken and how each will be funded. Citizens deserve concrete multi-year plans before being asked to support an extremely high level of indebtedness, which will limit an additional borrowing without new revenues for decades to come.